A little while back told you guys about the curried cauliflower soup and moroccan couscous in mapled acorn squash I made the evening that Robert Caplin from the New York Times came to photograph us for the article. I gave you the soup recipe which was delish, but was totally complimented with my Moroccan Couscous and Mapled Acorn Squash. Cut the squashes in half and remove the seeds. Place the squash halves in a casserole dish face up. Spread some Earth Balance on the cut side of each squash and place a pad in the center. Brush the squashes with maple syrup. Sprinkle them all with cinnamon. Bake for 45 minutes until slightly browned and bubbly. While they're baking, prepare the couscous. In a pot boil the broth, Earth Balance, salt, and spices. While this is boiling, toast the pine nuts in a dry pan (watch them carefully as they can easily burn. Once the stock is boiling, add the couscous, currants, toasted pine nuts and mix. Let it steep for 15 minutes (do not open the top during this process). Once all the liquid is absorbed, fluff the couscous with a fork. 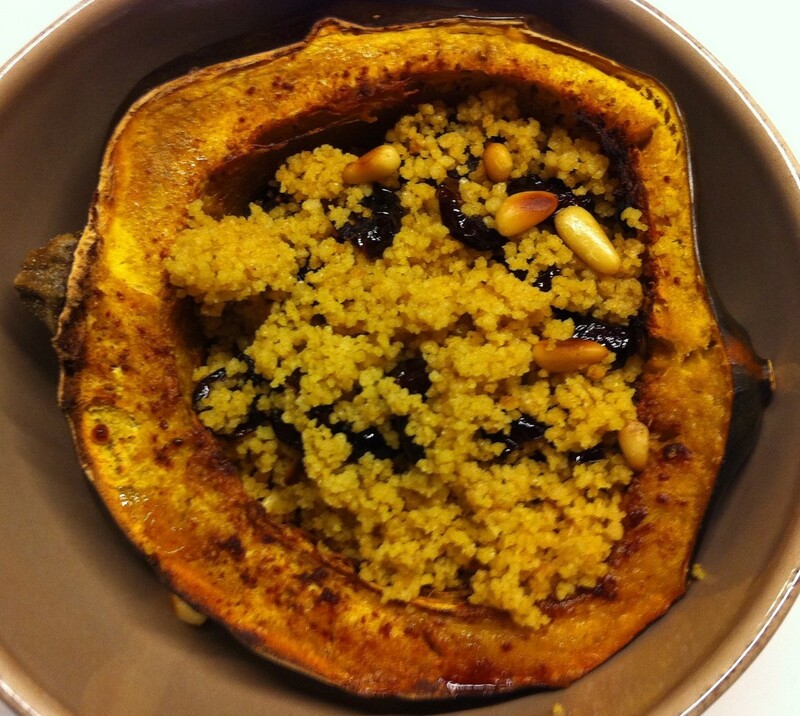 Spoon the couscous into the acorn squashes and serve hot!